Friends, this is just a quick post to let you know that Ariel and I have arrived in Jerusalem. We left Pittsburgh Sunday at 4:50, arrived in Amman today at 3:15 local time, and made it to Jerusalem by about 7:30 this evening. As we took the overland route from Jordan through the King Hussein/Allenby Bridge, you might be interested in knowing that the Israelis checked our passports EIGHT times before we were allowed to get on the bus to Jerusalem. The previous past details where we’re staying. Let me now just mention the tremendous hospitality that we have found, beginning on our Delta Airline flight, where the cabin crew read over the Lonely Planet Guidebook with us so that we could find the spots that they most enjoy here in the Middle East, and then they gave us four litres of water to carry into Israel with us. On the bus from the border to Jerusalem, we encountered a young man named Joshua, who not only helped us find the right bus stop, but he got off with us, bought us a drink, and walked us to our Guest House! Finally, when all the internet cafes were closed, the owner of a coffee shop brought out his own laptop so I could post this message. No charge. So please don’t worry about our safety tonight. We might worry about yours instead. We have already been to see the Western (Wailing) wall – about a fifteen minute walk from our place. We enjoyed Falafel and Shawarma for dinner. It’s a blessing. A blessing. More soon. On Sunday, August 29, Ariel and I leave for the last and lengthiest leg of the Sabbatical travel adventure: a month in the Middle East. As a Pastor, I have many, many friends who have spent time in “The Holy Land”. Opportunities to visit Israel and its environs are not rare, especially for Pastors willing to travel. Yet most of my life, I’ve been content to visit elsewhere. It was not until I began watching “That the World May Know”, a series of teachings by Dr. Ken Vander Laan (see Follow The Rabbi for more information on his ministry) that I began to think about the tremendous impact of place on theology. As the plans for the Sabbatical came together, we decided that it may very well be that we take a tour of Israel with a group of family or friends at some point in the future. To that end, we decided to try to do Israel on our own and hook up with a tour that will encompass some other areas of the Middle East, including Jordan and Egypt. More about that tour in a future post. Sunday, 8/29 – depart Pittsburgh at 4:30. Change planes in NY, and arrive in Amman, Jordan, at 3 pm local time on Monday 8/30. As soon as we clear customs, we will make our way to the Israeli border, where we expect to wait in long lines and get a taste of the tight security for which Israel is well-known. Following that, we hope to make it to Jerusalem by nightfall. Monday, Tuesday, and Wednesday night we plan to stay at the Christ Church Guest House, a part of Christ Church (the oldest Protestant church in Jerusalem). This facility is staffed by Christians, Jews, and Muslims, and we hope to be able to engage in some genuine conversation with local people about the complex issues facing those who live in the Middle East today. On Thursday, we expect to spend some time visiting The Sabeel Ecumenical Liberation Theology Center in Jerusalem, where they have a noontime worship service. In preparation for this leg of the journey, I read and was greatly challenged by “A Palestinian Christian Cry for Reconciliation” by Naim Stifan Ateek. In this persuasive tome, Ateek asks the church to follow in the way of Christ and work for liberation, reconciliation, and peace in the Middle East. I was delighted to be invited to visit the center when we are in Jerusalem. After worship, we’ll rent a car and drive north (facing the decision that Jesus faced – whether to go due north through “Samaria” or take the highway by the Mediterranean and Tel Aviv) towards Galilee. Thursday night and Friday night we will stay at The Kibbutz Ginosar, located right on the Sea of Galilee. While here we hope to explore Nazareth, Capernaum, and other sites in the region where Jesus undertook most of his ministry. If I’m lucky, I’ll get to fish in the Sea of Galilee! Saturday night we’ll drive back to Jerusalem and stay at the Guest House. Sunday we hope to worship with a congregation in the city and then head back to Amman in time to meet our tour group with whom we’ll experience Jordan and Egypt. “If you’re not willing to be changed by a place, there’s no point in going” (unknown). We don’t know what this trip will hold, but we trust that it will be rich in many ways. Stay tuned for updates! 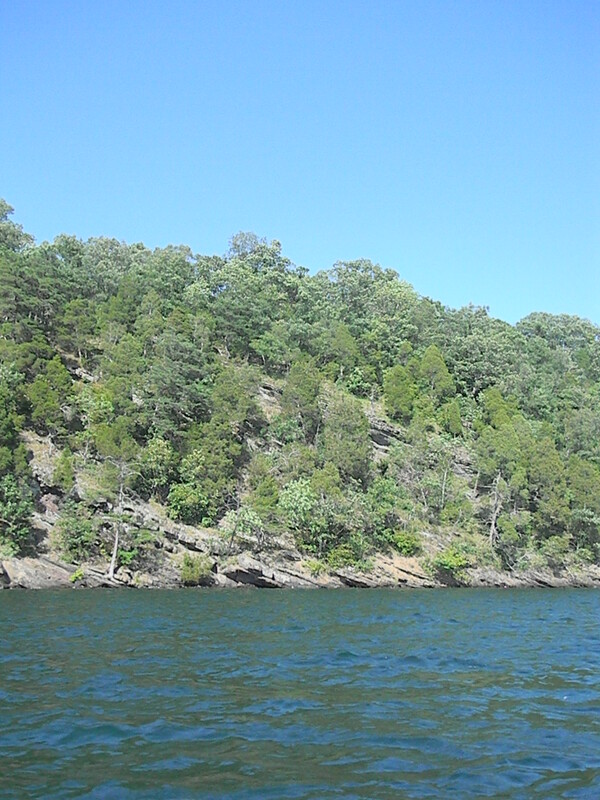 While staying on the Blue Gill at Raystown Lake, I often wandered up onto the Sun Deck and looked down at the water – about ten or twelve feet below. 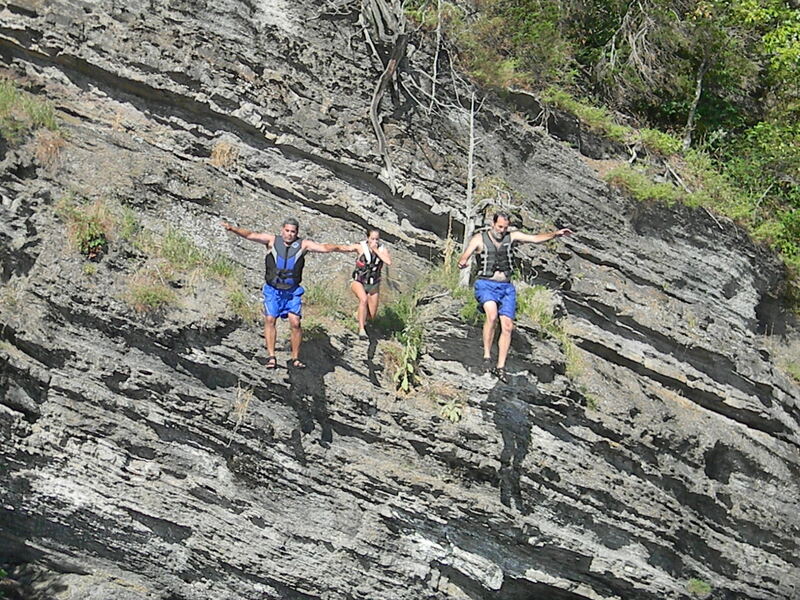 I wondered how it would feel on some of those hot days to leap from the highest point of the boat into the deep and cool water below. I didn’t try it, though, until the day that my friend Adam was visiting. I was putzing around in the kitchen, and he was exploring the boat. I heard him walking around up top, I heard the furniture moving, I heard running, and as I looked out the back door of the Blue Gill, I saw Adam fly past and land in the water with a shout of joy. I wanted to try – but I didn’t want to go alone. 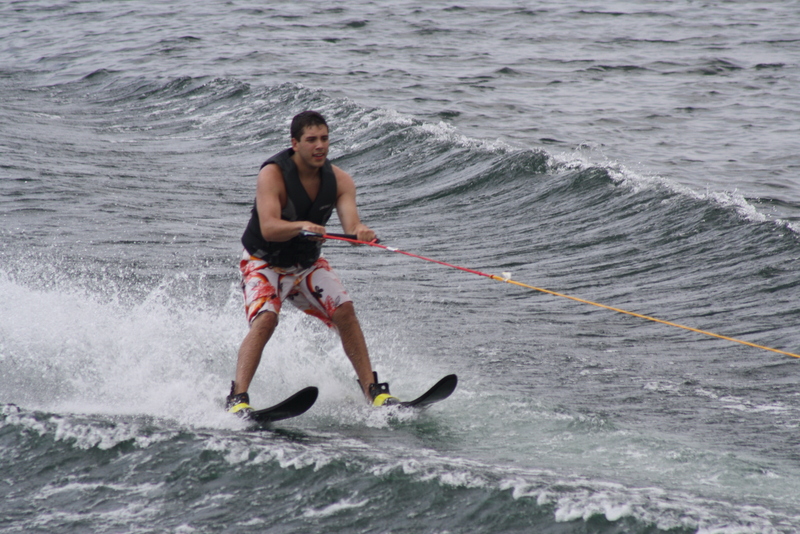 Having Adam encourage me allowed me to venture into a new place of joy and recreation. In the days that followed, I taught others the joy of taking the high dive into the lake from the top of the Blue Gill. 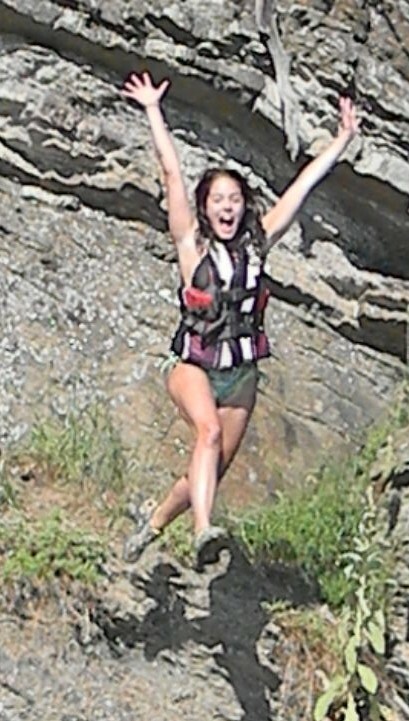 A typical rocky wall face at Raystown Lake. And so it was that Amy and I, along with her dad Alex, found ourselves climbing up a rock face and jumping into a lake (I know, “If all your friends were jumping into a lake, would you do that, too?” In this case, evidently, the answer is “Yes, I would.”) It was a rush of adrenaline and a great joy to share that memory with these two dear people. I have been blessed with a great “cloud of witnesses” (Hebrews 12:1) who have encouraged me to learn and grow through my entire life. As a result, I’ve been able to experience a great many thrills and deep, deep joy. I’ve also wound up with the occasional black eye and skinned knee, but you already know about that. As I continue the Sabbatical, my hope is that I might be the kind of person who is inviting others to “take the plunge” on a daily basis. Maybe you’re not jumping into a lake, but I hope that somehow my life is an invitation to grow in your ability to become more fully the person that God intends you to be. More than that, my hope is that you are calling your friends to dive deeply into the great opportunities that are put in front of each of us daily. To all of you who have been an encouragement to me, THANKS! And may each of us keep looking for ways to experience the joy that God has for us even when they seem a little risky. The Osprey scans the waters for its next meal. The Osprey’s powerful wings filled the air with sound as it lifted itself from the water, winging towards his perch with a sushi dinner. 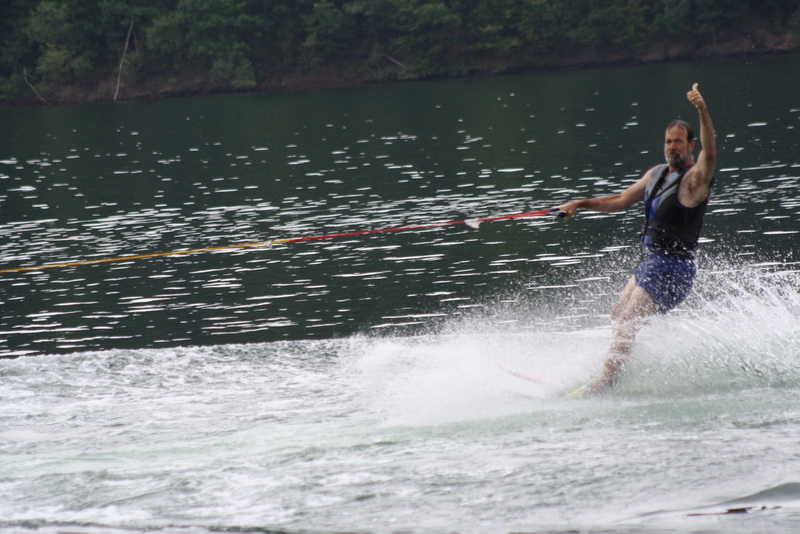 My friend Tim and I had been drifting through the cove at Raystown Lake for a couple of hours. 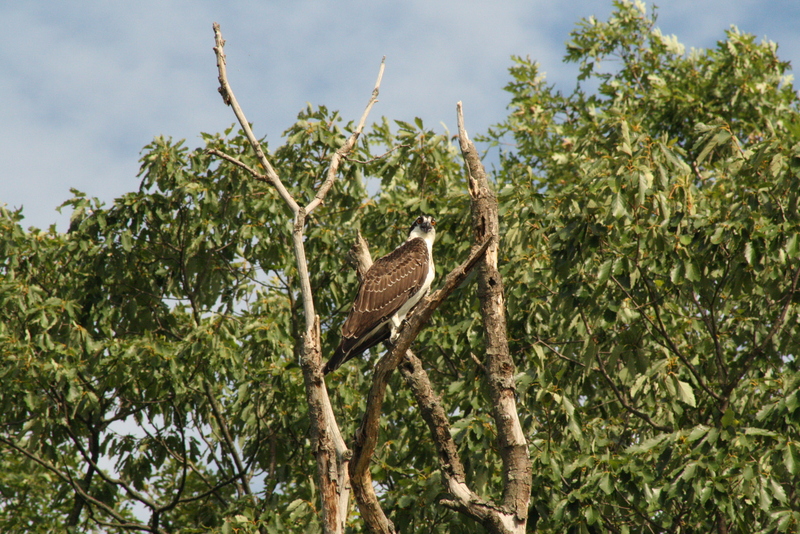 Although we weren’t catching many fish, there were three Osprey who were having a pretty good night. 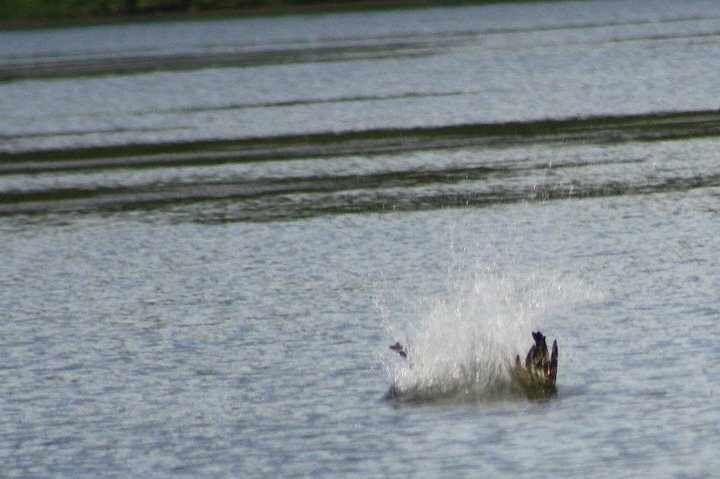 We’d watch as they soared high above the water and swoop down, flutter for a few moments, and then hurl themselves into the water to grab their prey with razor-sharp talons. It was simply amazing – better than fishing! The Osprey is a raptor (a “bird of prey”) that grows to a height of nearly two feet. 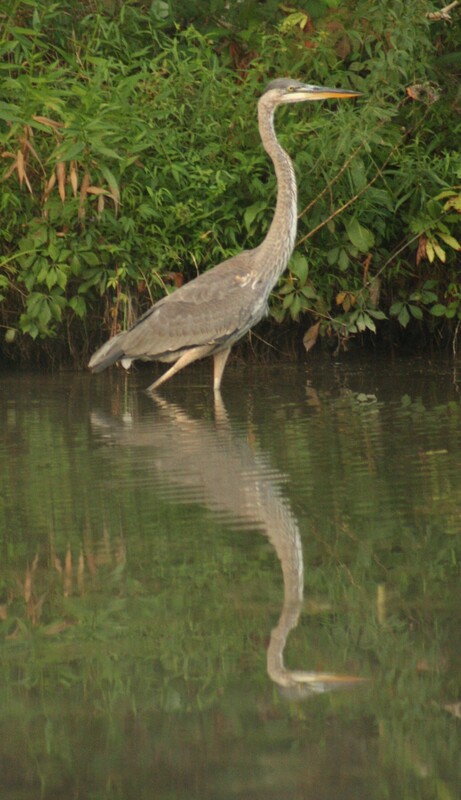 Its wing span is five or six feet wide, and it can weigh between 2 1/2 and 4 1/2 pounds. It’s called a fish eagle, and the word “osprey” comes from the Latin ossifragus, which means “bone-breaker.” While Bald Eagles are limited to simply flying above the water and grasping fish that are near the surface, Ospreys are able to become completely submerged and then fly away with their dinner. The Osprey is an immensely powerful bird. It was that power that attracted our attention as we observed this display of fishing prowess. 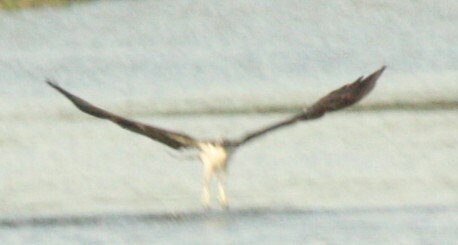 The air is a blur as the Osprey's powerful wings lift it from the water. As I listened to the tremendous amount of air being pushed aside by these massive wings, it occurred to me that the Osprey is a special creature. We’d seen a lot of birds that engaged both the air and the water. Ducks and Gulls, for instance, are always around the surface of the water. 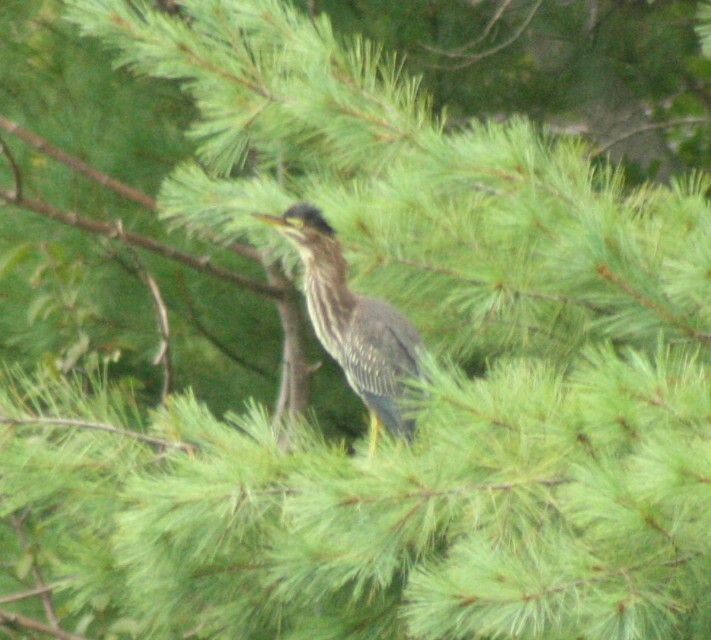 Herons prowl the shoreline in search of small animals and fish who are unlucky enough to be caught away from cover. Cormorants, which have been known to dive nearly a hundred feet beneath the water’s surface, were plentiful at Raystown. Yet none of these birds had the combination of amazing strength and grace that the Osprey possess. The Osprey is so impressive to me, I think, because it knows to which world it belongs. While it is capable, and even willing, to enter the water in search of a meal, it is first and foremost a fierce creature of the air. 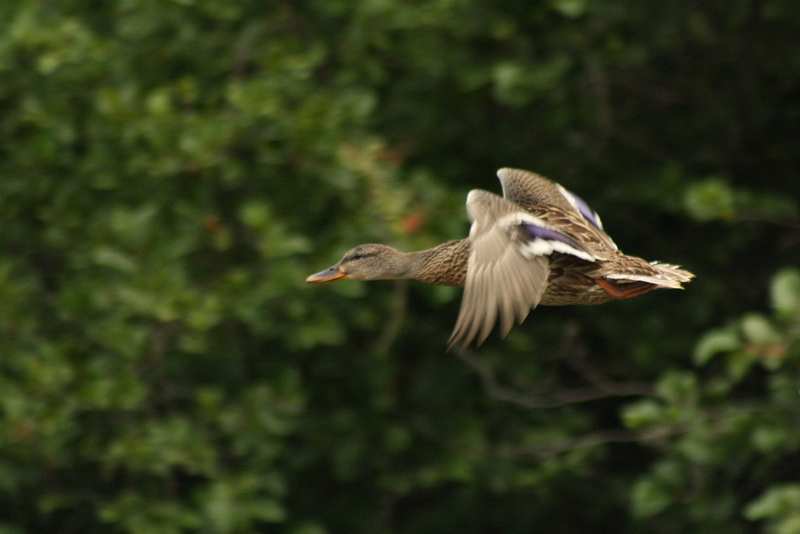 Its wings lift it through the air and propel it heavenward, even when heavily laden. My hope and prayer is that during sabbatical and during my every day life, I remember who I am, and whose I am – that I live in the environment for which I was created, and that I continue to grow into my true self – my “child-of-God” self. Like I said, it’s better than fishing. 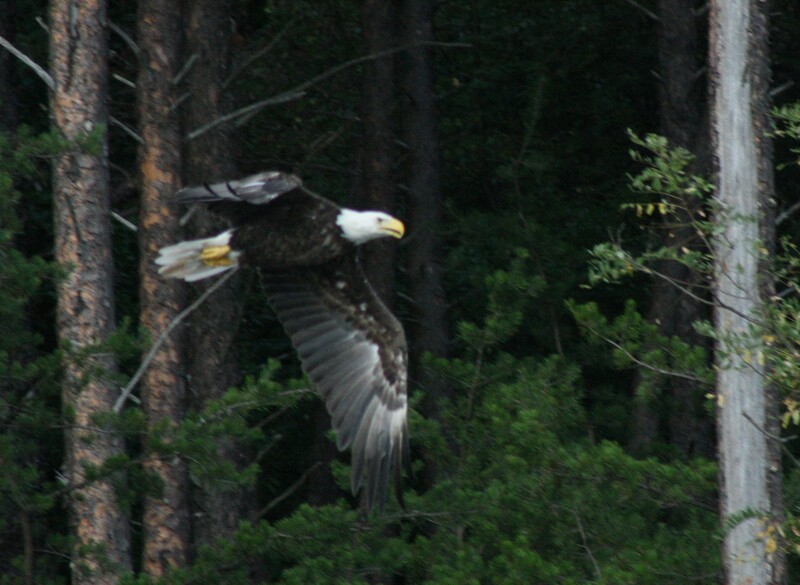 A Bald Eagle on the hunt. Geeky readers will recognize the title of this post as the title of the fourth volume of Douglas Adams’ The Hitchhiker’s Guide to the Galaxy. The Hitchhiker’s Guide is a smart and quirky exploration of what it means to be human and a part of the universe which is, of course, unimaginably vast and complex. In the book, Adams tells about the destruction of the planet Earth by a race called the Vogons – Earth being demolished in order to make room for a new hyperspatial express route through the universe. As the plot to the book unfolds, it becomes apparent that humans, (the third most intelligent species on the planet) are unaware of their impending doom, while dolphins (the second most intelligent species) are not only aware, but manage to get out before the planet is destroyed. To read more about the Guide, click here. To see a video featuring a song called “So Long, and Thanks For All The Fish”, click here. Warning: it’s really silly. Is that a vision, or what? Here’s the reason that I’m thinking about this line right now: because I’ve left the friendly confines of the Blue Gill and re-immersed myself in life on Cumberland Street. As I drove back yesterday, it occurred to me that life on the water was really like living in a parallel universe. 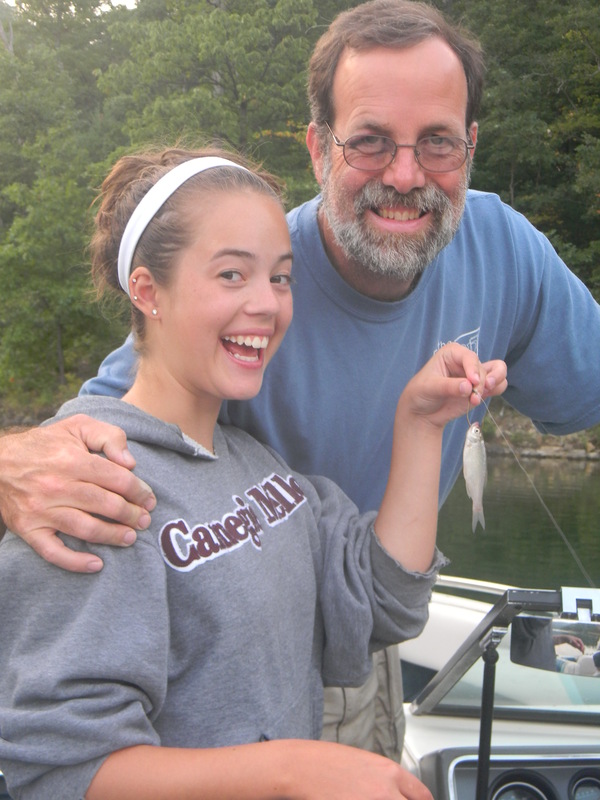 I was able to be in contact with friends and family, and I pursued my passions of reading, fishing, and boating…but all within the confines of a couple of square miles (and even more rigidly, on board the 44-foot Blue Gill). Except for swimming and a brief hike with Sharon one Saturday afternoon, I was never really off the boat for nearly three weeks. It was amazing! In fact, when I was leaving the marina, Pam (one of the many incredibly helpful and gracious staff at Seven Points Marina) came around the desk and said, “Wait, wait, wait…let me see…Yes, he is wearing shoes.” It was the first time since my arrival on August 2 that Pam had seen me with anything on my feet – because who needs shoes when all you’re doing is padding around a houseboat, swimming, or buying bait? First and foremost, I want to publicly thank all the folks at the Marina for a wonderful Sabbatical experience. From the time that Mike walked me through the operation of the Blue Gill and showed me all the ins and outs of navigating that craft to the time when Tom settled my bill on the 20th, those folks were eager to make sure that every second on the water was a blessing. And it was. I also want to thank those of you who sent notes, called, or otherwise contacted me during the trip. Even though I was in a different place, it was a joy to be able to connect with people from various parts of my life. Is the sun rising on a new day? Or setting on one that is past? So much of life is about perspective, isn't it? When I got home last night, I experienced a little bit of “the blues”. I had been told to expect this as the Sabbatical progressed – a sense of mourning at the passing of various opportunities. Last night, I realized that even though I had not left the Commonwealth of Pennsylvania during the month of August, in many ways I was (like Adams’ dolphins) in a parallel universe. I was playing at house while on the boat – I had my own (rented) bed, a mini refrigerator and a small bathroom – all the comforts a guy like me needs…but it wasn’t really home. There was no mail, there were no bills to pay, no TV to watch, no news (yes, I went through an entire month without hearing about the Steelers!). Yet there was also no real community – I was always seeking the most private and remote places to moor. There was no communal worship. There were no neighbors stopping by to help me pick blueberries. The absence of these things gave me the chance to reflect on how important they are in my life. There will be a few more posts in the days to come reflecting on lessons learned on board the Blue Gill, but at this point, I do want to simply say how grateful I am to have been there, and how good it is to be home. So to Pam, Tom, Sis, Mike, Gary, and everyone else at the Marina: So long, and thanks for all the fish. It was a privilege to be on board with you. And to Samaiya and Sheldon and Lindsay and Dani and Glenn and everyone else who is a part of my more “regular life” in Pittsburgh, thanks for your presence on the journey, and for helping me discover beauty in each of the sunrises and sunsets that God puts into our days together. When the Lord of Life began to re-shape humanity by means of the Gospel, he put himself in the company of fishermen. Not your Robert Redford A River Runs Through It trophy-hunting sportsmen, but rather strong, honest men who contended with the uncertainty of the waters for their daily bread. In building a community that heralded the Kingdom, Jesus called those who had spent years reading the surface of the waters, trusting each other in the cooperative nature of net-working, and appreciating a nourishing meal at day’s end. 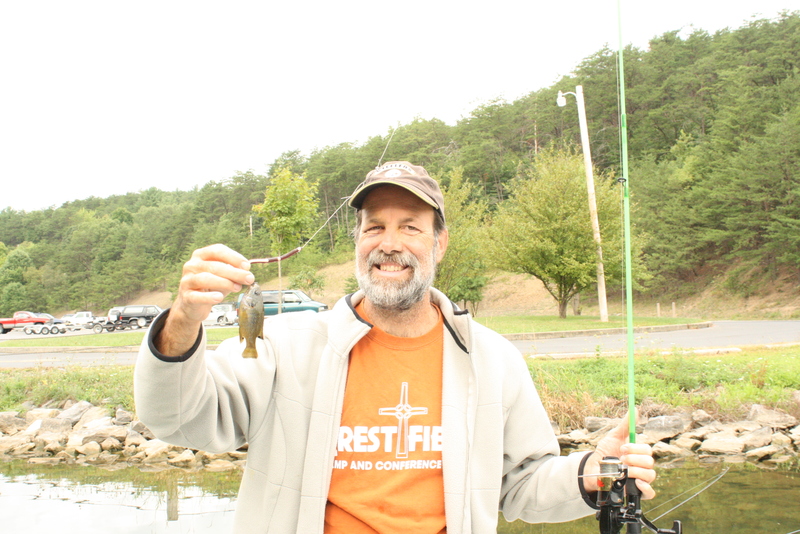 Pastor Dave Carver is a fisher of fish. If he has a chance to spend a few hours alongside the creek or the lake, it’s a good day. If you are there to fish with him, then it’s a better day. And if you and a few friends agree to sit on the deck and share not only the freshly-grilled catch of the day but also the contents of your hearts and minds, then it’s about the best of all days. 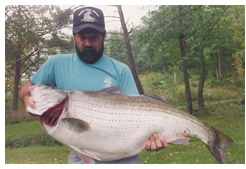 Sparky holds a striped bass that weighed nearly 54 pounds - his fourth state record fish from Raystown Lake. And, you see, that’s who I see myself, most days. That’s who I’d like to be. But when I get in the middle of things, sometimes my priorities and expectations get a bit skewed. 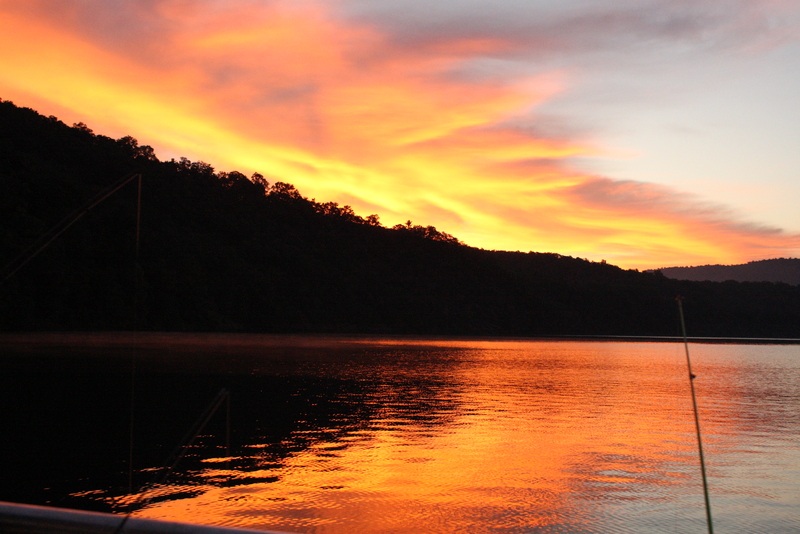 Take fishing at Raystown Lake, for instance. In my “cover” materials, I say that I want to fish for “real” fish; I want to be able to feed my family and friends, and that the trophy doesn’t matter. Of course, when I show up at Raystown, I decide to go ahead and hire a guide who just happens to have the PA State Record when it comes to fishing for Raystown’s “signature species”, the striped bass. As you may have noticed, there are no photos of me holding giant fish. 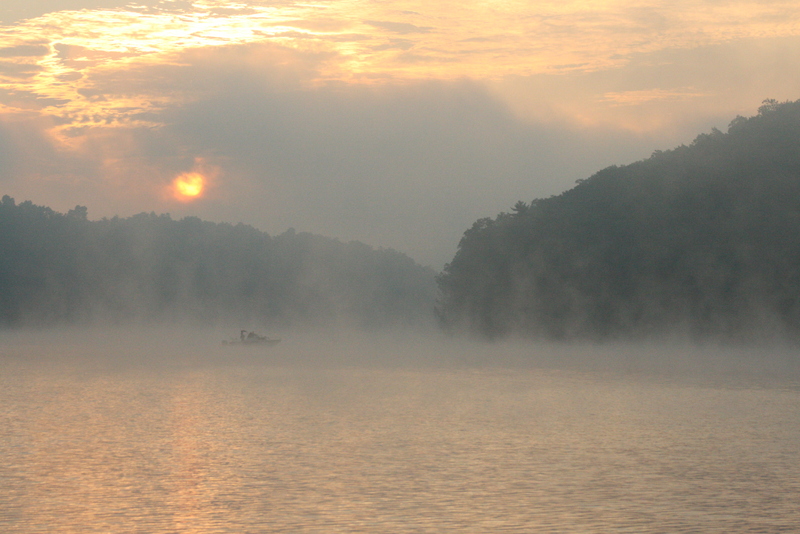 But yesterday was the best day of fishing I’ve ever had at Raystown Lake. Why? Because I got back to basics. Dave Carver holds a blue gill weighing nearly two ounces, one of four that he caught with Tim while fishing James Creek. 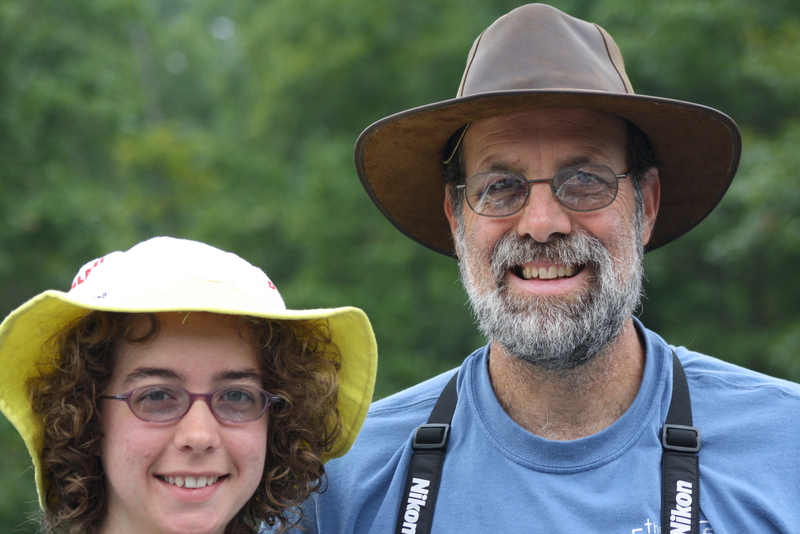 On Tuesday morning, I was joined for almost 24 hours by my good friend and fishing/birding partner, Tim. 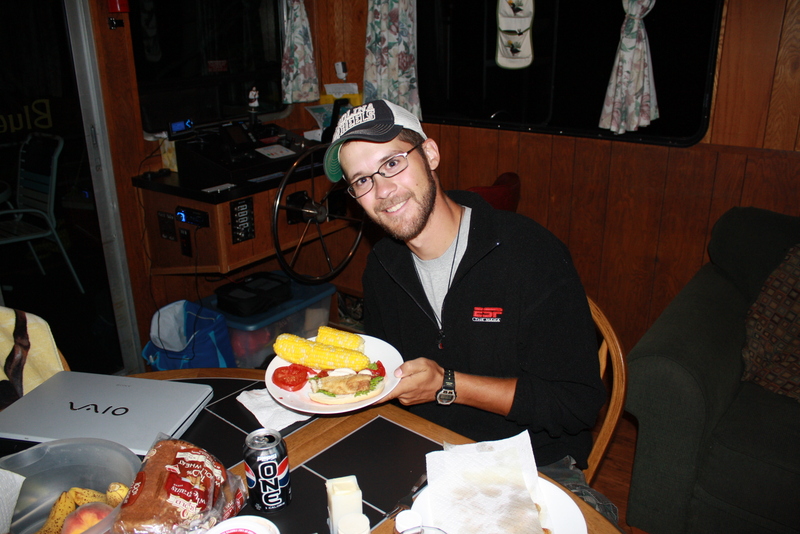 When he arrived, we enjoyed a delicious meal of fried catfish and corn. 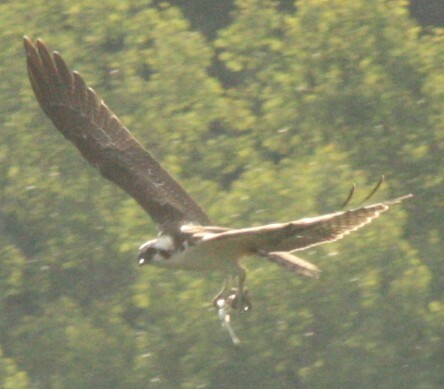 Then we went fishing, and while we brought in a few nice bass, the real treat was watching the pros – a trio of Osprey put on a fishing clinic for us. More about that in a future post. An osprey, looking rather disdainfully at a couple of amateur fishermen. Wednesday we got up early and didn’t do so well in terms of putting fish on the stringer…OK, we struck out in that department. 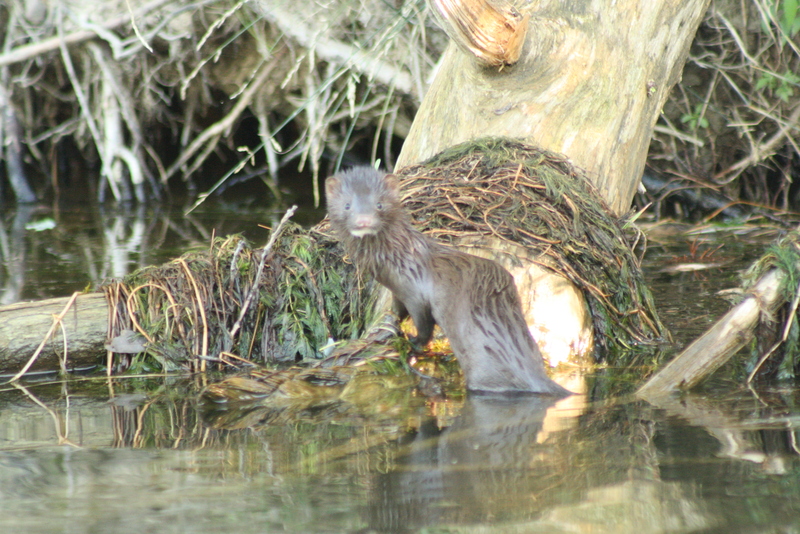 But we saw a mink, a pair of bald eagles, a snake, some turtles, and about eight species of birds. 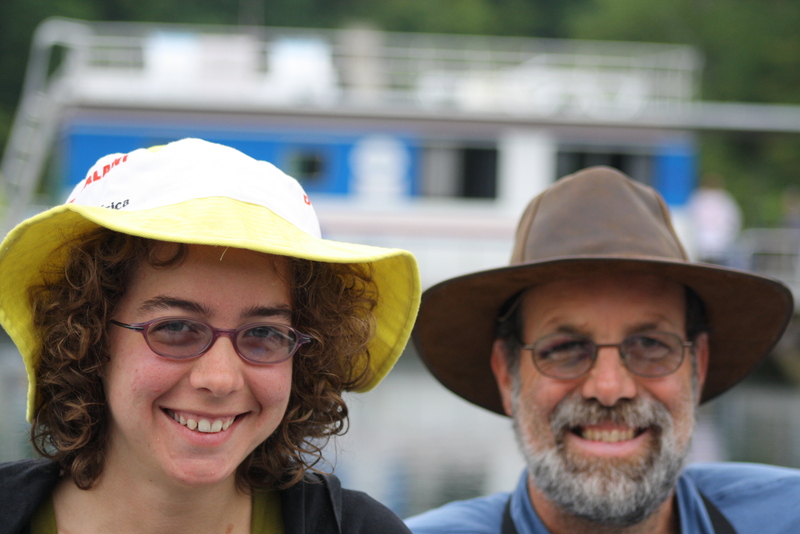 As I bid farewell to Tim, it occurred to me that it was the second anniversary of my dad’s death – the man who taught me to love fishing and to care for the earth. As I cruised around the lake, I gave thanks for the life of the man who so enriched the first half of my life. When it got to be evening, I thought I’d troll around the deep end of the lake. “Who needs a guide to get stripers?” I thought. You could hear them jumping in the night. Every now and then, one would jump clear out of the water. “I can do this,” I thought. Well, not yet I can’t. No stripers. No problem. Ariel’s friend Mina had come through with some chicken livers for her friend Dave, and so I sat on the back of the houseboat with a few lines in the water. I was looking for a couple of really nice channel catfish – make a few steaks for the freezer and set myself for winter. What happened, of course, was that there were no channel cats. But let me tell you something marvelous: whereas I was watching the lines hoping for a giant strike followed by a huge battle ending with me one-arming the net laden with a giant fish into the boat, what I saw was a series of subtle bumps and twitches. At first, I didn’t see anything when I reeled my line in. But then a small bullhead took the bait, and I saw what I was dealing with. I lightened the weights on my line, put on smaller hooks, and went to town with these small catfish. I probably pulled in twenty or so. A fine day of fishing in what we called "catfish lake". 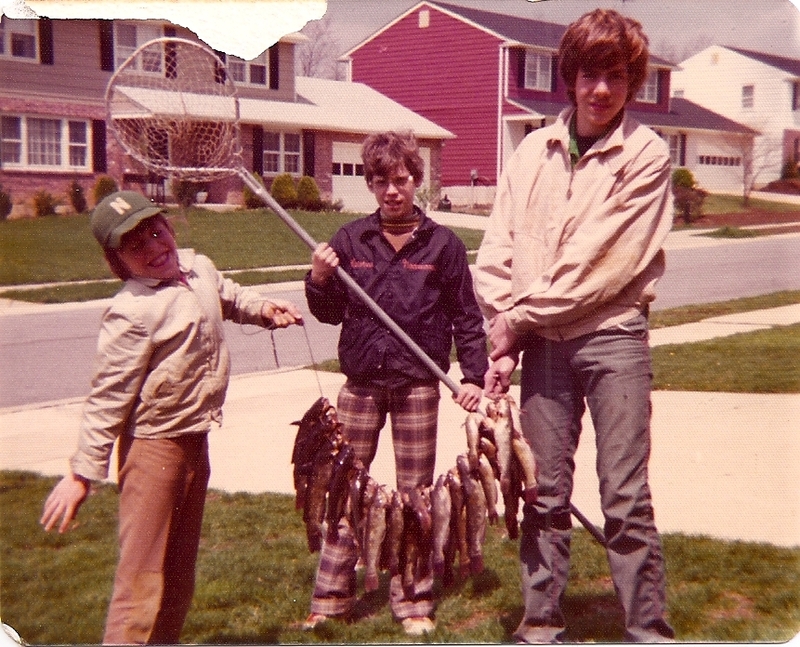 That's my brother Tom on the left, me on the right, and our friend Kevin in the center. Dad is, of course, behind the camera. When we were kids, my brother and I would go with my dad to a lake in southern Delaware that has a real name, I’m sure. We just called it “Catfish”, because every time we went there, we wound up with a mess of bullheads. They are not particularly difficult to catch, and they are a royal pain to clean. But they taste great. And today, they will taste sweeter as I remember that I continually need to remember to keep the main thing the main thing, and to take what the Lord offers. It was a great evening to remember my dad; it was a wonderful time to acknowledge the fact that my happiness so often depends on my expectations and my ability to be flexible and to deal with the things that are actually here, rather than my hopes or fears. Maybe I’m the only one who needs a reminder, every now and then, that it’s ok to switch the tackle and adapt to the situation that I have, rather than doggedly pursuing the situation that I wish existed. Maybe I’m the only one who needs to remember that sometimes the gifts of God come with a bump and a twitch, and not a giant splash. Maybe I’m the only one who wanders away from where I say I want to be and in doing so lose my focus and my ability to be God’s man in this time and this place. But if you’re still reading this, then I bet that I’m not the only one. I hope your day is blessed with a couple of little nibbles and a few prizes that bring you joy. In my last entry, I asked people to consider various scenarios wherein a guy like me could end up with a black eye while spending 18 days in the peace and serenity of Raystown Lake in central PA. Thanks to all who took the time to comment and offer feedback – you added a great deal of levity and joy to our conversations in recent days. The Blue Gill is 44 feet long. You can see a floor plan by clicking here. My faithful and loving wife had arrived with a couple of beautiful steaks to put on the grill. We had a nice little spot picked out in a cove near James Creek. For a map of the lake, click here. The water at the stern of the boat was about 18 feet deep, with a sandy bottom. I put a few chicken livers on the rods and set them at the stern. The grill and table are at the bow, where the water was only six inches deep. No problem – I could see the rods perfectly when I sat at the table – a scant 38 feet away with a straight shot down the cabin of the Blue Gill. No sooner had I sat down to this delicious, rare, piece of beef than the rod started to dance – I mean to tell you, I thought it was going over the side. Something BIG had a hold of the chicken liver. Without a thought to the dinner before me, I leapt to my feet and scrambled to save my catch. Unfortunately, the welcome mat just inside the cabin slid on the floor. To steady myself, I reached to grab the dining room chair…only to discover that the chair had casters. Who puts wheels on a chair on a boat??? The chair gave way, and my face crashed into the metal armrest. Meanwhile, my foot scraped across the threshold, my knee caught the table leg, and I went down, cursing myself and the rod that kept leaping as if to taunt me. As my glasses went flying and the blood started to flow, I crawled to the back door, only to discover…that a snapping turtle had taken the chicken liver, the hook, the sinker…and my pride. Most of the staff at the marina know me and my story. Do you know how embarrassing it is to walk into the bait shop every day and have a bunch of people asking you, “Hey, Dave, how’d you get that shiner?” and have to tell them that I slipped on the carpet chasing a turtle? How glad I am that my family gave me some other stories to spice things up. It would have been so much more interesting to have been in a fight or developed an alter ego. But I am who I am…an incurable fisherman who just keeps hoping and dreaming. One of the gifts of Sabbatical is the ability to spend time in new ways. I may always be in the “rut” of needing to fish whenever I can, but I hope that I am able to invest these days in getting a new perspective of what it means to be a faithful friend, partner, pastor, and person. I hope that I never lose the ability or desire to drop a line in. 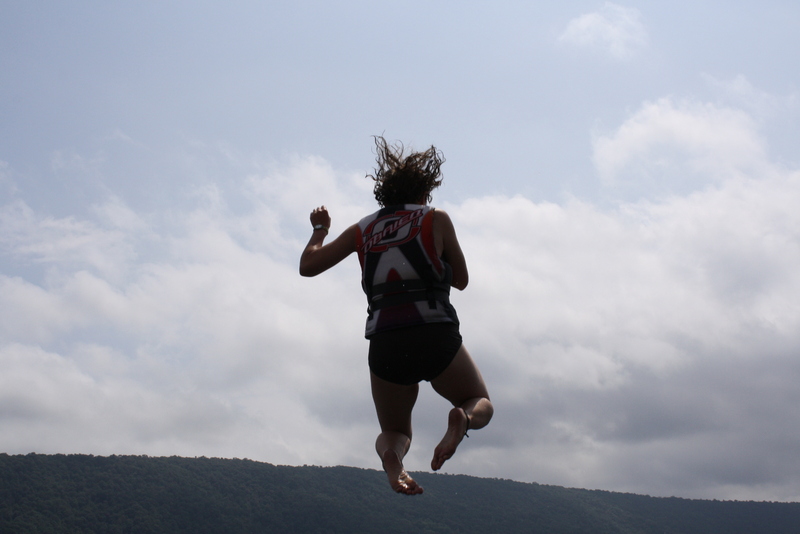 And, frankly, I hope I never lose the intensity that makes me want to chase a jumping pole halfway across a houseboat. But I also hope that I never forget that God has placed me where I am, and that it is a good, good place. I hope that as I drive through the trees, I remember the forest. 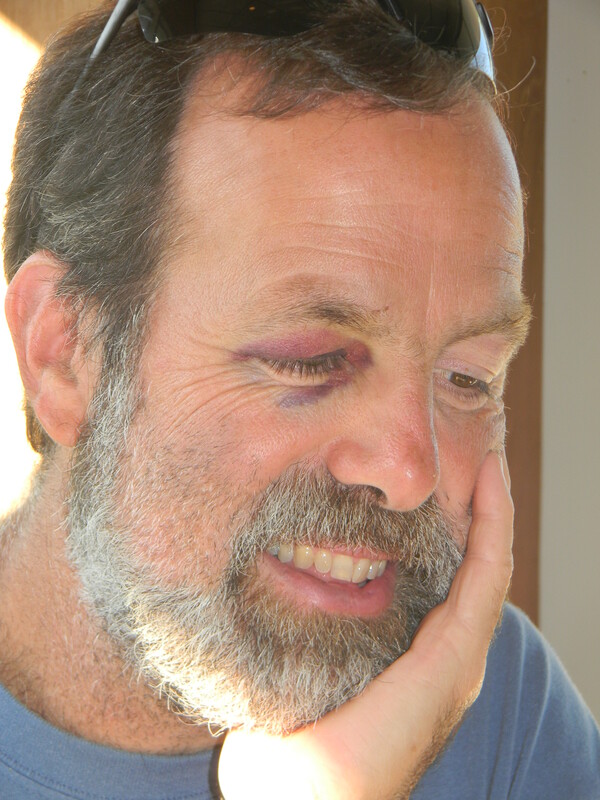 So thanks for giving me a laugh with your stories about the black eye. And thanks for helping me to remember what is really important as we share the gifts of God. Yes, of course, THE HAT has made it onto the Blue Gill. Seriously - where would we travel without it?